Profile: Who is new Welsh Tory assembly leader Paul Davies? 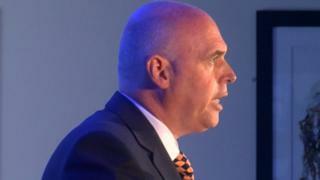 Paul Davies has been elected leader of the Welsh Conservatives group in the Welsh Assembly. The Preseli Pembrokeshire AM beat South Wales West AM Suzy Davies in the race to succeed Andrew RT Davies who stepped down in June. Born in 1969 Mr Davies grew up in the village of Pontsian in Ceredigion. He attended Llandysul Grammar School and Newcastle Emlyn Comprehensive School. For twenty years Mr Davies worked for a bank before being elected to the assembly in 2007, at the second attempt. He had also failed to be elected to Westminster twice. Described as a safe pair of hands by some, and a "man in a beige suit" by others, Mr Davies was appointed deputy leader of the Welsh Conservative group in 2011. It was a role he held until he became interim leader over the summer. Unlike most modern politicians, he avoided Twitter - only opening an account on the social media platform as he launched his leadership campaign. In a recent interview, however, he dismissed claims he was a colourless politician. He has also said he Is open to working with Plaid Cymru to form a government and has promised to give Conservative members a vote on any future coalition deal. Paul Davies backed Remain in the 2016 EU referendum but says he accepts the result and disagrees with calls for a second vote. Mr Davies lives in north Pembrokeshire with his wife Julie. The couple were married in 2006. He says his interests outside politics are rugby, reading and visiting historical attractions.